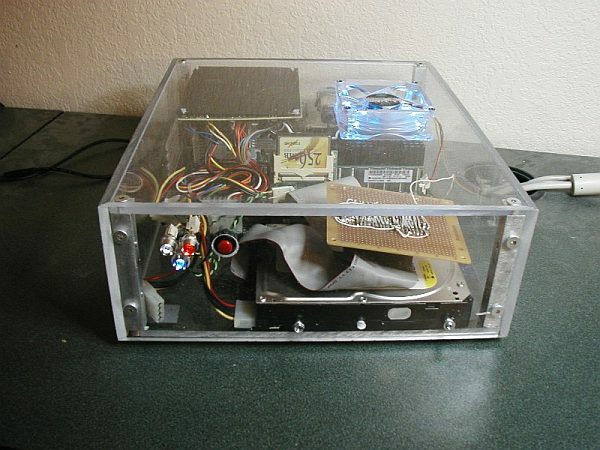 This was the first serious media server I built. I built it into a home-made acrylic case. The pref-board visible on the top of the harddrive is the adapter that I had to make to get the 50-pin low-density connector to breakout into a real 40-pin IDE cable. That is the secondary IDE channel. The whole PC is contained on that one PCB. It used to be a Dell WebPC. The no-ip client, so I could connect to it anywhere on the internet regardless of what IP my ISP gave me. 333GB of storage space. For 2004, that wasn’t bad.